Our scope is limited to how to save data files, not fixing the computer or saving application programs. Before fixing a broken computer, it is a good practice to save the data to an external hard drive following the steps below. Then disconnect the external hard drive from the computer to avoid its being accidentally formatted during repair. Repair procedures may cause permanent loss of data in many ways. For example all data on the boot drive will disappear if the computer is restored to factory settings by running a recovery disc. In this case the data can only be partially recovered afterwards. Click on the steps below for more instructions. Step 1: Remove the drive. Wear an anti-static wrist strap to avoid accumulating static body charges that may damage delicate electronic parts upon contact. Be careful to not strip the heads of the screws holding the drive access panel. 1. 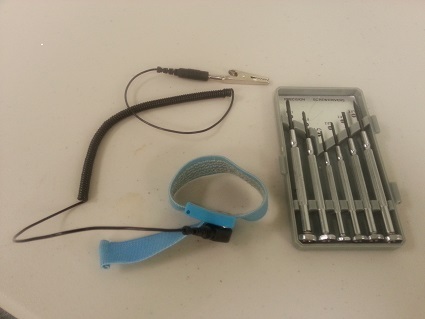 Tools: Screwdriver and anti-static wrist strap. Step 2: Install the drive in a USB enclosure. Consumer computers usually come with an SATA drive that can be installed in a USB enclosure with a form factor of 2.5" (laptop) or 3.5" (desktop). Many models cost about $20 (as of July 2013) and support both USB 2.0 and the much faster USB 3.0, with the latter achieving 200 GB of saved data per hour in our limited testing. Business server computers may come with SAS and SCSI drives that require a SAS or SCSI disk controller, respectively. (They cannot be installed in a USB enclosure.) For a hot-swappable SCSI drive, you also need an SCA adapter (about $10) to connect the 80-pin connector on the drive end to the 68-pin SCSI connector on the controller end. Step 3: Plug the USB enclosure into a second computer. Find a second computer running Windows®. 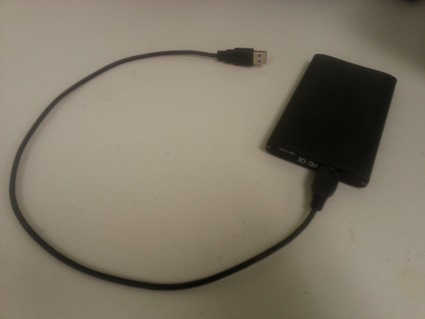 A USB enclosure can be plugged into a USB port on the computer. For a SAS or SCSI drive, you must install the corresponding disk controller in the second computer (desktop or server computer only) and connect the drive directly to the controller. See slide shows in step 2. CheckDisk or ScanDisk must not be allowed to run while the computer boots up. They may cause irreversible data loss. What if a second computer it not available? Buy a new identical drive and install it in the broken computer. Restore the computer (with the new drive) to factory settings by using a recovery disc or CD. You can also install a new copy of Windows® on the new drive. The original computer in this case is also the "second computer". Use Windows® Explorer and Disk Manager to determine the status of the drive. If it is not shown in Disk Manager, the drive hardware is not working. If it is shown in Disk Manager, the drive hardware most likely is working normally. One of the scenarios described below may occur. Scenario 1: The drive is accessible in Explorer. The drive is good. Data can be copied to an external drive. Scenario 2: The drive is shown in Disk Manager but inaccessible in Explorer. In Disk Manager the drive may be shown with or without a drive letter. See how to recover a corrupted drive. Scenario 3: The drive is shown in Disk Manager but is unstable. The drive works intermittently. See how to recover a drive that hangs or goes offline intermittently. Scenario 4: The drive is undetectable by Disk Manager. The drive hardware may not be working. See how to recover data from a drive undetectable by Disk Manager.